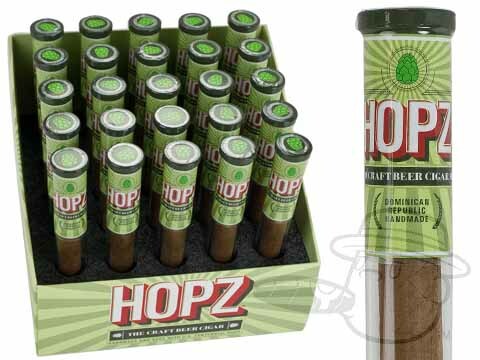 If you've been looking for the perfect cigar to pair with a nice, hoppy brew, Hopz cigars were made with you in mind. After working for more than six months with many different kinds of hops and tobaccos, Ted's Cigars came up with Hopz. Hopz is made with a Cameroon wrapper, Connecticut binder, and Dominican filler, and then seasoned with Centennial hops for a one-of-a-kind taste that's just begging to be enjoyed with a strong India Pale Ale. If you don’t appreciate the distinct, piney taste of hops, Hopz cigars are probably not for you—otherwise, grab a cold one, light one of these up, and prepare for a smoking experience unlike any other!